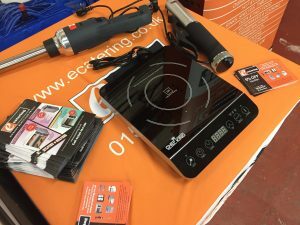 eCatering, one of the UK’s Leading and Lowest Price Online Catering Equipment Suppliers are travelling around in 2018 meeting customers as well as speaking with them on the phone to gather purchasing insights, and the results are astonishing. In 2018, to support their Booker promotional days, eCatering has gone a step further than just speaking with customers on the road, they are looking into the buying habits and choices customers are looking for with their purchases. Whilst businesses will look at prices and after sales service, these are not always the reason they buy what they buy and from who. Confidence in brand, website appearance and easy ways to pay are often more important. An online customer does not necessarily buy the cheapest, some of our customers have indicated that they ‘just get a feeling that its right and make the purchase’. eCatering isn’t on the road selling products directly like traditional sales channels, they are making potential customers aware of their presence, brand and quality. These insights will help them as they develop their brands, improve their website and bring more products into the UK Market. 2018 has been very positive for eCatering with sales building year on year and as we go forward, it seems, they will be going from strength to strength by delivering exactly what the customer wants.